The installation is a crucial part of any project. Even the most pre-eminently planned projects can present numerous problems. With extensive experience and knowledge in most industry sectors, RDM installations can deliver peace of mind providing solutions to unexpected issues. Industrial electrical installations are our key business. RDM Installations offer a wide range of quality installation types for small and large businesses and projects alike. We specialise in, installing controlled automation systems for all industries including bespoke automation, dust extraction, logistics, water treatment as well as weighing and conveying. Whether it’s a simple £50.00 start stop or a £20,000.00 multifunction inverter drive control system, in a safe zoned area or in a hazardous zoned area, RDM Installations will fulfil all installations. RDM maintains a very high standard in accordance with relevant regulations while maintaining safe working practices and creating a safe working environment. RDM Installations are proud to say that we have performed successful installations for many organisations. Some of the larger projects include traffic light systems for Aldi Distribution Centres, integration and installation of Door and dock management systems for Tesco distribution centres and fully automated batching, weighing and conveying systems for several large organisations. 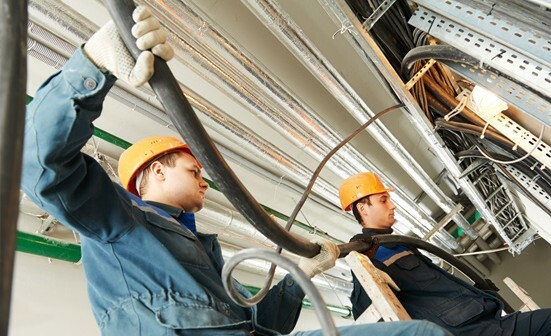 Electrical installations and system integration can be a very complex process but with the right company employed to carry out these tasks, the results can be achieved quickly. Our engineers have extensive background knowledge on all kinds of control systems and together with our control panel manufacturing partner Pace Automated Systems UK Ltd. PAS UK Ltd design and manufacture control systems for all industry sectors. RDM have the technical support and ability to perform any electrical system integration where it can be deemed possible. When dealing with multifunction complex control systems simply connecting the control system to the machine at the other end isn’t sufficient. RDM engineers have an extensive knowledge of the setup of soft starts and variable speed drives. With technical support backup in the office, RDM makes your installation complete. Testing and commissioning is a standard part of our installation routine ensuring that your control systems are operating efficiently as possible. RDM offer a full site survey accompanied with a comprehensive site and job-specific risk assessment if required. Our quotations offer a full breakdown of costs. All of our engineers receive a full brief of the assignment from their project manager/leader prior to the work commencing. All our installations are completed with a basic site installation report as standard. A work completion certificate will be issued once one of our senior engineers has inspected the work and is satisfied that the work has been carried out to our high standards. RDM recognise the importance of maintaining safe practise at work. At RDM working safe is a culture rather than a tick box exercise. We ensure that all our engineers are regularly trained in all aspects of health and safety matters and maintain the same level of standards to working safely as our installations. guaranteeing competence, quality and value for money. Factory down time is a costly headache that most businesses would prefer to live without. Employing the right company that can correctly diagnose the problem and repair it quickly and efficiently is key to every industry.